600HP 7.3L Ford F250 Truck COLD START! - Muscle Cars Zone! 600HP 7.3L Ford F250 Truck COLD START! This guy is performing a truck cold start after his truck being left outside enduring pretty low temperatures over the night. Last time he has started his truck has been over a week. The truck has 250/200% injectors, electric fuel, and a dual terminator pump. The engine fitted in this truck is a 7.3 engine producing 600HP. The engine starts right away producing some of the best sounding 7.3 cold start that you would ever hear. Even if you are not really a Ford guy, you can`t say that the sound doesn`t sound decent. This good old 7.3 engine fires right up. Maybe Ford made a mistake not building it anymore. On the other hand, Ford did not have any choice because of emissions regulations. Because of the regulations, Ford had to start using the 6.0 engine. We found one flaw in this guy maintaining his truck. He doesn`t cover the exhaust pipes when it rains or snows. The rain or snow may quickly go into the engine and cause various problems if a huge amount packs inside. The only thing this truck may need sorting out is the interior. Nevertheless, it`s a pretty mean machine. 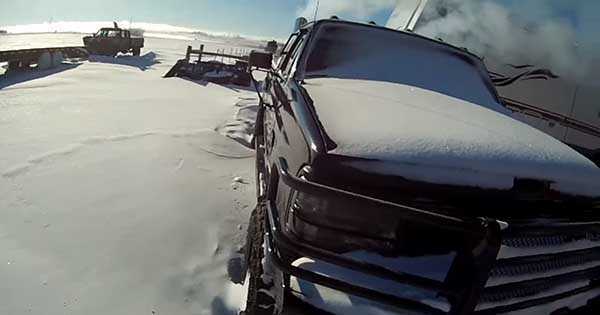 The truck cold start in this video is pretty amazing. This guy also says that this engine starts better than all his other trucks which have some modifications on them. He even promised to make a -20 start video when. We would really want to see that, it would be a feast for every gearhead`s eyes. At last, check out this Losi 5T 4×4 truck drifting like a pro!